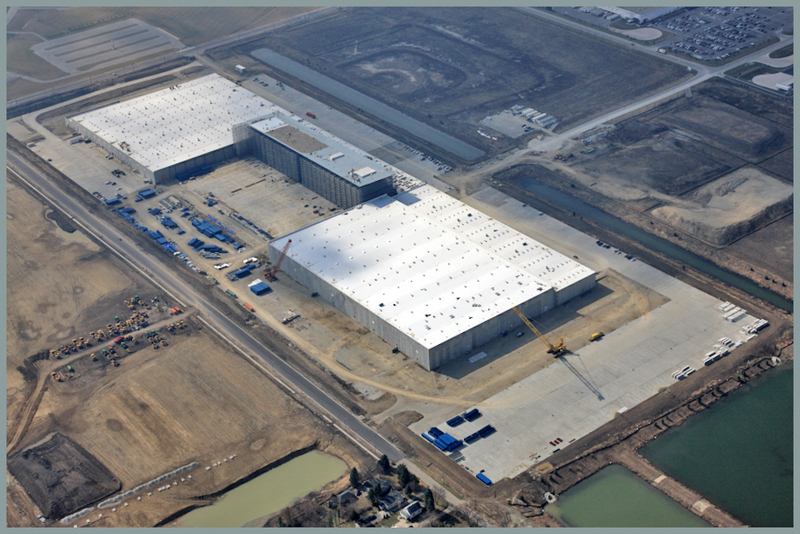 Ikea’s new distribution center under construction in Joliet, Illinois will also have the state’s largest rooftop solar array. What is expected to be Illinois’ largest rooftop solar array is under construction in Joliet, but it isn’t the initiative of a utility or solar company. Instead, the system will be paid for and owned by Swedish retailer Ikea as the company boosts its overall renewable energy portfolio. The array, which will sit atop the company’s new Midwest distribution center about 45 miles southwest of Chicago, will have a capacity of 2.91 megawatts (MW) and consist of almost 9,000 panels spanning 470,545 square feet, according to Ikea. It is expected to produce 3.4 million kilowatt-hours of electricity each year to be consumed onsite at the facility, which will reduce carbon dioxide emissions by 2,398 tons per year. That’s the equivalent of taking 506 cars off the road annually, according to the U.S. Environmental Protection Agency’s greenhouse-gas equivalencies calculator. Construction is expected to be completed in the fall. Ikea is just one of many businesses making significant investments in renewable energy and smart-grid products in Illinois. And this isn’t Ikea’s first rooftop solar array in the state. Its two Chicagoland stores in Schaumburg and Bollingbrook also generate solar power onsite. Solar panels atop Ikea’s store in Schaumburg, Illinois. Photo courtesy of Ikea. Across the country, Ikea has solar atop 90 percent of its locations, the company says, with a total capacity of more than 40 MW. In 2016, the U.S. had a total installed solar capacity of 42 gigawatts, according to the Solar Energy Industries Association. Because of their large roofs and relatively limited electricity demand, distribution facilities are a particularly ideal site for rooftop solar, which can provide anywhere between 60 and 90 percent of a site’s power consumption, Roth says. The remaining electricity is supplied by the electric grid. Private businesses and institutions across the country have increased investments in renewables and smart-grid technologies in recent years, and they are expected to continue to do so, even if federal clean-energy funding and tax credits are rolled back under the Trump administration. In Illinois, several high-profile companies outside the traditional energy industry have spent considerable time and money on projects that effectively make them an extension of a more distributed, renewable-based power grid. The Illinois Institute of Technology, a private research university on Chicago’s South Side, is home to a 9-MW microgrid consisting of a wind turbine, natural-gas turbines, battery storage and other advanced power systems. It enables the campus to completely island itself from the broader grid during power outages, which the school says has helped it save about $1 million annually in operating costs. A rooftop solar array and a recently installed energy storage system help keep the lights on and the water temperature just right at Chicago’s Shedd Aquarium, which is known more for its acrobatic dolphins and waddling penguins than it is for its smart-energy systems. Shedd’s battery offers the aquarium the ability to sell stored electricity back to the broader grid, making the facility a node on an expanding and evolving power grid. In 2013, Chicago-based pharmacy chain Walgreens debuted a “Net Zero Energy Retail Store” in Evanston. When completed, the store — which has two wind turbines, nearly 850 solar panels and a geothermal system that stretches 550 feet into the ground — was estimated to consume 200,000 kilowatt-hours per year while generating 220,000 kilowatt-hours per year, for a net gain of 20,000 kilowatt-hours. “Our purpose as a company is to help people get, stay and live well, and that includes making our planet more livable by conserving resources and reducing pollution,” Mark Wagner, Walgreens president of operations and community management, said in a statement at the time. For its part, Ikea aims to run on 100 percent renewable energy by 2020, and it has pledged to invest $2.5 billion in renewable energy through the end of the decade. While many corporations lease solar installations from power companies via power purchase agreements, or they purchase renewable energy credits to offset carbon-based power, Ikea instead owns and operates each of its rooftop solar arrays, the company says. The company has also built a major geothermal system at its store near Kansas City to meet its heating and cooling needs there. Ikea also owns 104 wind turbines in the U.S. — 49 of which are in Hoopeston in central Illinois near the Indiana border. The farm, which began generating power in March 2015, has a capacity of 98 MW, roughly enough to power more than 30,000 homes per year, depending on wind conditions.